We’re far enough north that summer is over. While the trees are green and the sun is as warm as ever during the day, at night it has been getting very, very cold – enough that we all rush into the tent and jump into our sleeping clothes as quickly as possible in order to enjoy the warmth of our bags. And those sleeping clothes have gone from a t-shirt to now, for me, taking the form of a pair of long running tights, wool socks, a long sleeved undershirt, a fleece pullover and a hat. Yesterday was another great day. With our new supplies, breakfast was a round of oatmeal studded with raisins, cranberrys, and a pint of local wild blueberries complemented with the obligatory shot of maple syrup and a small lake of milk. With that, we were back to try to spot the damn belugas that we are told are in the bay here every other day (meaning, having not seen them yesterday we’re supposed to see them today). We stopped in at the visitors center so the girls could get a popsicle (they had spotted these the day prior and had dominated our conversations since, so Val and I wanted to simply get it over) and color in some complementary Beluga pictures. Leonie made a FrankenBeluga out of hers, replete with stiches and a large bolt protruding from its neck. 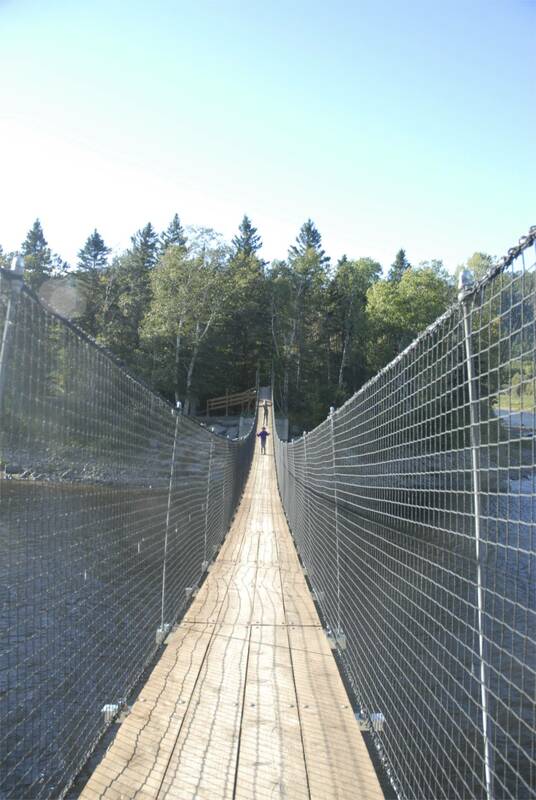 Then it was off to the trail, where once again the suspension bridge over the river was an early highlight. The tide was quite visible out along the way, and by the time we had hiked the three kilometers to the observation tower the rocky shoreline had been completely exposed and a sand beach (or river bottom, depending on the time of day) revealed. The girls scrambled down the rocks and the day, once again without the presence of whales, was a huge success regardless as it quickly became an all-girl climbing clinic. Leonie is a climber, and not just in the “kids will climb stuff” vein. She will shimmy straight up sign posts, traffic lamps, and in once case in the Catskills, football stanchions. Here, she was presented with the glorious, ancient granite of the Canadian Shield, unearthed for her pleasure by glaciers tens of thousands of years ago. Off she went, with Sylvie in her wake, getting herself higher and higher until even my “I don’t mind being a bad parent” default settings were overcome and we had to wave her down. With the tide coming in, we got the girls to work down the beach with us toward a small point in the trail that intersected the beach about half a kilometer away, and we enjoyed the wind, the sun, the clouds racing in, the rain, and the sun again with the extraordinary Saguenay fjord as a backdrop. I suppose a pod of belugas would have been the icing on the cake of the morning, but as it stood, it was terrific nonetheless, leaving us (or at least certainly me) feeling quite connected with the land. We made it down the trail as more low, grey clouds gathered and came in, and took our lunch in the information center. While the girls tested out the various stuffed animals and hats, Val and I discussed two issues: what to do next, and perhaps most pressingly, what to do about the fact that we haven’t seen a Laundromat in a couple of weeks and the girls are running out of clothes, and we are starting to smell a little too “woodsy” to be able to socialize effectively with other humans. So I corralled the ranger at the front desk and asked her about laundry. 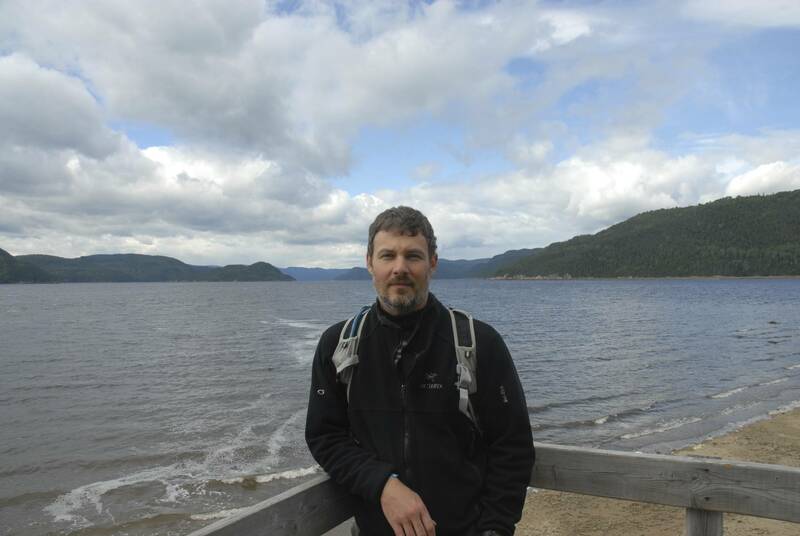 She thought about it, because there was nothing that came to mind for her immediately, but she didn’t want to send me all the way back into Tadoussac or Les Bergeronnes. Her colleague joined the discussion, and as I pointed out the various stains, markings, soot patches and general scent of woodsmoke and man on my person, we agreed the situation was grave. Then, the woman behind the counter remembered that a farm just down the road from the campsite had a coin laundry along with their rental cabins in the back. Oh, and the place also has a petting zoo. My jaw dropped. A Laundromat / Petting Zoo at that point in time was probably just about the least likely yet most fantastic combination we could think of. So I turned to the kids and said, “hey, do you guys want to go to a petting zoo while mom and I do some laundry” and didn’t have time to zip my jacket before they had raced off to the parking lot to buckle themselves into the truck. En route, I gave the standard Dad Disclaimers about the event – never been there, don’t even know if it is open or if there will be any animals, etc. Whatever, Dad, just keep driving. The clouds rolled in and the rain came down, making it more or less a perfect time to be doing laundry but we pulled into the “Ferme des 5 Etoiles” we both knew it was too good to be true. At the front desk, I told them we had been directed there by the park because they had a Laundromat and a petting zoo. Could this possibly be true? Yes, it was, and with a handful of quarters and $20 spent on a family pass for the zoo we set off. Val was charged with getting the first load washed and I headed toward a long, low building that the front desk directed me to. And instantly, it became the high note of our trip – we were greeted by an incredibly friendly, incredibly curious pig that the girls could barely tear themselves away from. But they did, and were rewarded with rabbits, chickens, chicks, pheasant and a large pen with a young beaver in it that was oddly delighted to see them. It jumped out of its wading pool, waddled past its “hello kitty” stuffed animal (an odd detail that stuck in my mind) and got up on its haunches to stick his nose out between the bars and give the girls a good sniff. We rubbed his head, and he raised both his paws to let us basically shake hands. A sign pointed to more animals outside. Off we went and discovered raccoons, geese, a peacock, some turkeys, and saw some very large fenced off areas along the border of the farm and the road. As we approached the first pen, which held several deer, we couldn’t see anything – the deer were apparently that wary and the pen was that large (as in, the size of a football field, and with trees, small hills, etc.) . However, the next pen over held a young female moose, just a year old and very curious to see the girls. She was huge, and just beautiful. Incredibly long legs took delicate steps forward to meet us, and her nose, a fantastic, long and lightly furred nose pressed through the bars give us a good sniff and allow the girls a rub. In the next pen, with a double wall, was an enormous cougar, an animal I had never seen alive. It was in a small enclosure at the far end of the pen, out of the intermittent rain, staring at us with its unblinking predator’s eyes and, in the way big cats have, establishing dominance over us despite him being, technically, on the wrong side of the bars. I called the girls over to have a look, and we all marveled at it. Presently, I heard a low growl and jumped back. Invisible but only five feet in front of me was another cougar, who had been quietly hiding in the bushes, inert and invisible, allowing me and the girls to stumble right upon her. Having made it clear that my family would have been lunch but for these bars, she got up out of her spot, and lazily wandered away. Val joined us and we saw more animals – a small herd of bison and their calves were enjoying turns at a salt lick near the fence, and we stood rapt at the size of the animals. As we approached, the adults all watched us and positioned themselves between us and the calves, staring watchfully. The girls loved this raw display of familial protectionism. Lastly, down a hill and through a smallish trail, we stumbled upon a huge enclosure that held a young adult bull moose, “Azul”, who happened to be right at the gate as we approached. As remarkable as the female had been, Azul was almost magical. A small viewing tower had been set up, and six feet off the ground we were at the height of Azul’s brow and the beginning of his antlers. He was as fascinated with us and the girls as we were by him. He offered up his nose, his head, and his antlers to the curious touches of the girls, gazing upon them with his giant, dark eyes and staying with us at the tower until we quite literally had to leave him. And we don’t have a single picture of him, or any of this, because who brings their camera to a “laudromat / petting zoo”? We made our way back to the laundry room and I began folding while val got her phone and hiked back down to the pen to grab a picture, but by then Azul had departed. We bumped into one of the staff at the farm and asked about the moose – where did they come from? Azul, apparently, had been given to the farm when he was discovered, motherless, north of quebec city. The young female had been found much more locally, near Sacre Couer. She went on to say that the mothers will typically leave their young while they head off and forage, as they have to eat an enormous amount to both feed themselves and nurse their young (a three hundred pound baby drinks a lot of milk). Sometimes, people will find these young animals and, not seeing the parents, will assume they are orphaned and try to care for them, or in disturbing the calves in their hiding spots, will leave their scent which will keep the wary parent away. The girls wanted to know if the girl moose and Azul were going to be put in the same place together. The answer was candid: no, not for another year, because Azul will try to mate with her and at his size he would crush her. Sylvie and Leonie nodded, knowingly. Then, the final treat: the woman who was answering our questions was about to feed Charlie, a deer that had been orphaned, perhaps Sylvie and Leonie would like to do this for her? The girls got a small bucket of feed and went to meet Charlie at the gate, and the deer stood there stomping his feet in anticipation of the feeding. Not clear who enjoyed the meal more, Charlie or the girls. ← 9/05… Punch Me In The Face. Gently.